Pitch Switch can change the pitch of any sound file without changing the playback speed. Now you can raise and lower the pitch up to 12 semitones (1 octave), so you’re always in tune. Speed up or slow down audio without the "chipmunk" effect. Pitch Switch can independently vary the speed of your songs without changing the pitch. Great for musicians rehearsing new music! Automatically remove the vocals from most sound tracks! Pitch Switch's intelligent audio engine automatically removes the singer’s voice from most songs. Now you can create your own karaoke tracks from existing recordings. 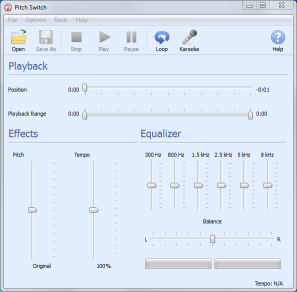 Pitch Switch supports most sound file formats. Once you make your changes with Pitch Switch, you can save your modified song for your iPod, MP3 player or CD!